Chuzachen hydroelectric power project is located in Chuzachen, Sikkim, India. The Chuzachen power project is developed on the Rangpo and Rongli streams of Teesta river. Image courtesy of Ppyoonus. Gati Infrastructure’s 110MW run-of-river project is based on Alstom’s Francis-type turbine technology. The Chuzachen hydroelectric power project (HEPP) is an 110MW run-of-river project located in Sikkim, India. It was developed by Gati Infrastructures (a subsidiary of Amrit Jal Ventures) on build-own-operate-transfer basis, at a cost of $71m. It is the first privately owned power project in north-east India. The Chuzachen power project was built as a part of agreement made by Gati with the Sikkim Government to commission three power plants at Chuzachen (110MW), Bhasmey (51MW) and Sada Mangder (71MW). 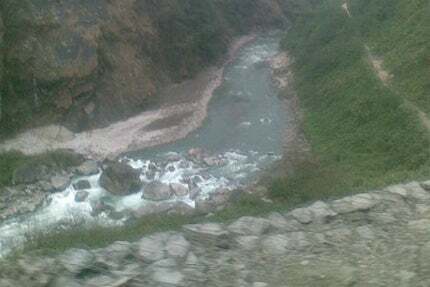 The Chuzachen hydropower project is promoted by the Sikkim Power Development Corporation. Chuzachen project obtained environment clearance in September 2005. The construction of the project began in 2007 and it became operational in 2013. It is expected to reduce 491,178 tonnes of greenhouse-gas emissions annually. "The independent power project is aimed at generating power from the two reservoirs on Rangpo and Rongli streams of Teesta river." The independent power project is aimed at generating power from the two reservoirs on Rangpo and Rongli streams of Teesta river, using headrace tunnels and a common surface penstock. The power house at Chuzachen run-of-river project comprises of two Alstom 55MW vertical Francis turbines. The turbines are equipped with the latest ring gate solution which increases the plant efficiency by suppressing the head loss. Advanced water bearings use the environmental conscious technology. The thrust-bearing membrane supports to minimise the friction loss while the self pumping bearing technology improves the reliability and safety with minimal operating costs. The river water is pumped into the turbines under immense pressure. The exit tube of the turbine helps in decelerating the water flow and recovering the pressure. The major works at Chuzachen power plant involved construction of the dam and head race tunnel at Rangpo and Rongli streams, and a common headrace tunnel. The Rangpo dam is a concrete gravity dam with a height of 48m and a capacity to hold 83,000 cubic metres of water. The Rongli dam is also a concrete gravity dam with a height of 41m, and can hold 45,200 cubic meters of water. The head race tunnel at Rangpo dam is 2,578m long while the tunnel at Rongli is of 2,258m long. The common headrace tunnel comes has an internal diameter of 4.6m and is 3,225m in length. "The exit tube of the turbine helps in decelerating the water flow and recovering the pressure." Chuzachen power plant includes a surface penstock of 801.2m in length and 3.3m in diameter. It also includes an open air power house and two generators of 49.5MW each. Other infrastructure includes outdoor switchyard and a surge shaft of 103m in height. During the construction phase, Chuzachen-Rangpo 132kV D/C line was installed with a zebra conductor and connected to the LILO transmission line of Gangtok-Melli 132kV S/C line. The transmission line was terminated after developing the 220kV/132kV and 3x100MVA GIS pooling substation at Rangpo. Infrastructure facilities included also construction of a 3.4km valve house road, creation of a steel yard with 1,500t of steel storage capacity and a weigh bridge. The power generated from the plant is directly transmitted to the central transmission utility through a 24km transmission line dedicated to the project. The transmission line will export 413.23GWh of power to the eastern power grid. AF Consult was awarded the contract for developing the general layout, optimising the water harnessing coming from Rangpo and Rongli rivers and providing a detail design of the project. Alstom India supplied two 55MW Francis type turbines for the plant. The contract for tunnelling work and other civil works was awarded to Prasad and Company. Balaji Engineers was given the contract for hydro-mechanical equipment supply. The scope of the contract included fabrication of the first stage embedded part anchor pin and base plates. Dan’s Energy Consulting provided consultancy services for the Chuzachen power project. Pakistani Prime Minister (PM) Nawaz Sharif has inaugurated an 84MW hydropower plant, the country’s first, on Jhelum River near Mirpur in Azad Kashmir. The World Bank has approved the $30m Kali Gandaki hydropower plant (KGAHPP) rehabilitation project in Nepal.